Just as the 19th century artists examined in the book Artists in Aprons, American Folk Artist Nancy Rosier has felt throughout her life the need to express herself in many creative mediums. Theorem painting, Nancy’s specialty, captured her attention some twenty years ago. 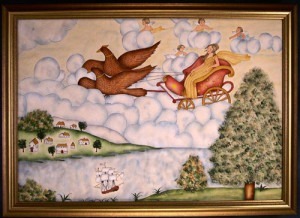 Nancy considers herself a true folk artist because she is self-taught. To achieve this level of painting, a great amount of research has been done, through reading as well as many trips to folk art museums throughout the country. Nancy learned her craft through studying antique theorems and reproducing them. After conquering the painting procedure and becoming adept at reproducing the 19-century theorems, she has branched out to include her own original designs. She is known for her elaborate museum quality theorems. 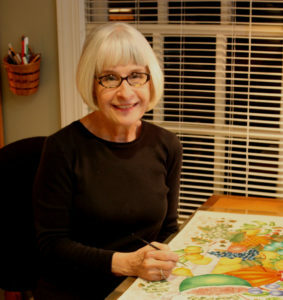 Nancy has become a nationally recognized artist and authority on theorem painting. Many magazines, newspapers, and several books have featured her work. She has been interviewed often and asked to write numerous “how to” articles. Her work is exhibited and sold at fine-juried shows across the country. She was chosen by the White House to create a theorem ornament for the Blue Room Christmas tree. 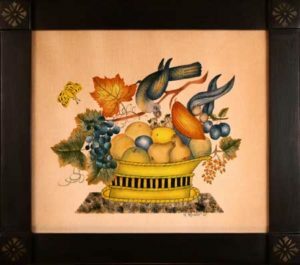 She has been selected each year for over twenty years as a member of the nationally acclaimed “Directory of Traditional American Crafts” which showcases America’s finest artisans who are dedicated to preserving the early American crafts.